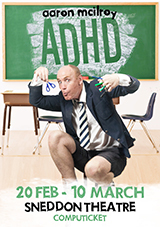 Join Aaron McIlroy on the funniest rollercoaster ride into the astonishing world of people with ADHD. Directed and co-written by Patrick Kenny, this hit show has enjoyed sell-out performances at the Grahamstown and Hilton Arts festivals. Scream with laughter as Aaron masterfully introduces us to a host of brand new, zany characters in this hilarious take on the ‘problems’ of this so-called ‘learning disorder.’ ADHD is Aaron and Patrick’s comedic steamroller without GPS, turning facts and theories – literally - on their heads. The show gives us a bird’s eye view into the chaotic and beautiful mind of Aaron McIlroy, who has lived with this ‘gift’ for the last half century. (Patrick is, as yet, undiagnosed). Advance booking is through Computicket at any Checkers money market counter, or via their call centre (0861 915 8000) or at https://online.computicket.com/web/event/adhd/1271826567 . Tickets cost R160, with a discount price of R130 for children (3 - 18), students and pensioners available at Checkers outlets or the Sneddon box office from one hour before showtime. Showtimes are at 7.30pm from Wed 20 Feb, with a 3pm show on a Sunday (no shows on Mondays).